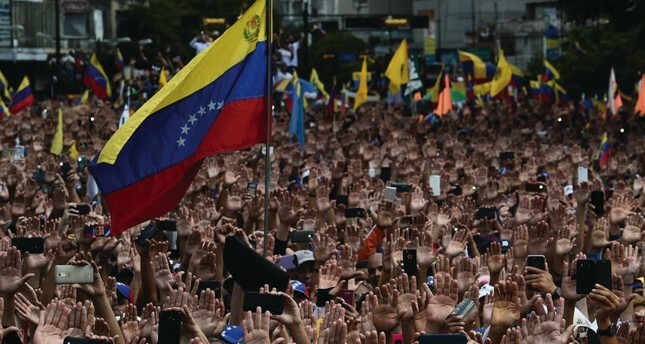 People raise their hands during a mass opposition rally against President Nicolas Maduro, in Caracas, Jan. 23. I saw Caracas in 1974 during the United Nations Conference on the Law of the Sea. Once Turkey had yielded all its innovative rights, research and developments to the United States. The political leaders used to say "Why should [we] be bothering with inventing the wheel when it is possible to get it from America for free?" We didn't comprehend the fact that if something is given for free, you are the product! By the same token, our politicians had left all our international relations to the U.S. Embassy in Ankara, and the U.S. diplomats had decided that we should never declare, say, "the rights of the historical waters" in the Aegean Sea. As if putting the Greek islands in a distance less than 3 miles in front of the Turkish mainland is not enough, those tiny rocks would (actually did) have equal rights with Turkey. The Foreign Ministry was prepared to skip the conference; however, thanks to my newspaper's vigilance, Turkey was represented at the conference and, today, Greece cannot pull the wool over the Turkish eyes in the Aegean. Caracas was the backyard of American capitalism and Western imperialism then. You could not believe the level of poverty in the middle of the sea of oil that Venezuela had. At that time, Venezuela was the richest country in Latin America on paper. It had the region's highest growth rates but inequality was setting in. For years, it was the most stable democracy in the South. But, in a couple of years, things began falling apart. The nation endured three coup attempts and one presidential impeachment. Per capita growth plunged, and mass protests became the norm. In your classical economic analysis's reports, you'd read conclusions like the "underlining the critical role of oil eventually crowded out other factors necessary for a healthy economy." Why did that level of oil production not result in the same stagnation during the years of President Chavez? During that time, oil accounted for 80 percent of exports and 40 percent of government revenue. Then why had Venezuela's dependence on petroleum exports not created poverty but wealth? Furthermore, why does that dependency begin producing what Noam Chomsky calls disaster under President Maduro's reign? Yes, Nicolas Maduro easily falls for provocations where Chavez would start making unexpected alliances at key moments. But still the answer is not hidden in Maduro's management style but in the international management style of American capitalism and its international imperialism. The magical word is "devastating" an economy with whatever tools it had at its disposal at that moment. President Trump had fired a tweet 11 days ago employing that magical word. He threatened to "devastate" Turkey's economy if it attacks PKK-linked terrorists in Syria after the planned withdrawal of U.S. troops from Syria. The very next day he turned around 180 degrees and started searching for new fields of economic cooperation'; this calls for another piece of magic called "talking to President Erdoğan on the phone," but that is another matter. Yet the annals of history will always show the use of that word "devastating." Venezuelan politics might have problems. Who doesn't? Go and ask Alexandria Ocasio-Cortez, the freshwoman from New York in the House of Representatives about political issues in the U.S. Massive U.S. pressure on any country could devastate its economy, finances and politics easily. President Maduro's principled resistance against these international pressures is exemplary. It is Maduro and the people of Venezuela that human history will remember with honor but not the U.S. or the EU. It might be the case that Venezuela plunges further into political crisis with this international "soft" warfare over President Nicolas Maduro's legitimacy as the country's leader. But the main reason that the next generations will remember would be that international intervention in Venezuelan politics.